Hello! I am here to share the very first episode of a brand-new pinball podcast! This addition to the absolute smorgasbord of podcasts already serving the pinball community comes from the perspectives of two women in the hobby who looked at the long list of podcasts out there and, through meticulous calculations, concluded that there might be room for a few more female voices to join the fray. We will be covering anything and everything in the world of pinball, talking with the people of pinball, and trying to keep a finger on the pulse of the growing presence of women in pinball…there may be some light traditional sports talk and a tangent here and there, as one might expect. 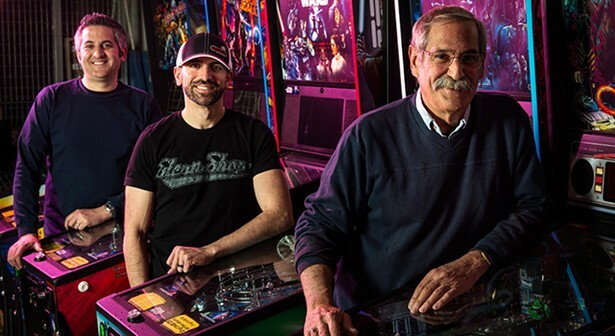 We’re looking forward to adding our voices to the pinball hobbyist chorus, and we hope you’ll join us! Introductions! The hosts interview each other! Pinball Glass feat. our first podcast shoutout! Steph’s Week in Pinball feat. our second podcast shoutout! Krystle’s Week in Pinball feat. our third podcast shoutout?! Awesome can’t wait to listen! Great to have some more female representation! Good first show. I listened to it on the way to work and through my lunch break. The second-first episode is here! Join Krystle and Steph as they work their way through doing an “actual” podcast episode! Steph also resolves to take less than a week to edit next time…also, to get her own Seawitch sounds. The sophomore curse hits hard in the post-NYCPC episode of Rip Tide! The audio was particularly affected. In a special-for-Pinburgh Rip Tide double shot, we cover what we’ve been up to in the interim between Episode 2, recorded late May, and now, and we share some of our excitement about Pinburgh! Stephanie pulled an all-nighter to get you two podcasts for the road - safe travels and happy playing, everyone! In this DEFINITELY NOT SUPER-LATE (I’m so sorry! - Steph) episode, we ride the post-Pinburgh happiness through a recap of our experiences. o Gfuel is Great, But Somehow We’re Discussing Granola and Stuff? In this amazingly professional episode, Steph and Krystle giggle off their Thanksgiving dinners while talking about the 24 Hour Battle, tournament directing, homebrew, and a smattering of other things pinball. o Detroit: Pinball Place, Food Recs? Back Together with Our Machines! Interesting production choice to put one person in each ear rather than mixing both people to both ears. Makes it a little harder to listen, I can’t have one ear free for other sounds. Switch it to mono audio in your podcast player, or set it to mono in your accessibility options on your phone. I agree that it’s harder to listen with each voice in different ears.